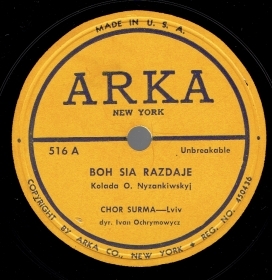 Owners of New York label «Arka Records» were Yaroslav Pastushenko and Roman Poritok. 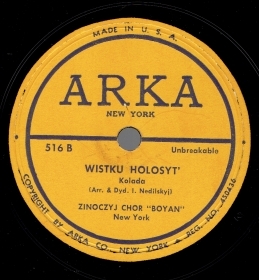 Label is distinguishable by its repertoire that consisted exclusively of recordings of Ukrainian soloists and choruses, existed at that time. The only exception is a few recordings copied from Polish label “Syrena-Electro” in 1934. The paper labels were of different design and color, depending on series that started with 100, 200, 400, 500 and 600. 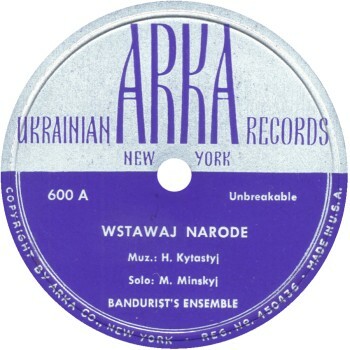 One can find records of such soloists as soprano: E.Mozgova, N.Andrusiv, tenors: M.Scala-Staritsky, O.Rusnak, V.Tisyak, baritone M.Minsky, New York chorus «Dumka», bandura ensemble of Levitsky and Yurevich, records with dance and light music. 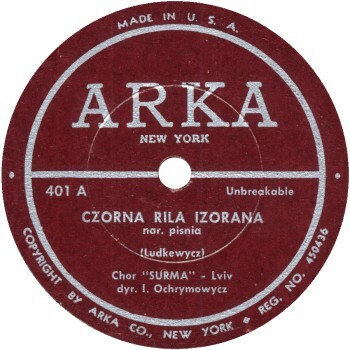 The total number of records «Arka» is about 100. There is no information about Canadian branch.